Oak Bay Parks is posting new signage in Uplands Park to remind visitors of Oak Bay’s bylaw that all dogs must be on a leash in Uplands Park during the bird nesting months of April – May – June. Wylie Thomas designed the poster and features 8 birds nesting in Uplands Park at this time of the year. Uplands Park is a sensitive Garry Oak Meadow ecosystem, and, with the collaboration of the Friends of Uplands Park, restoration is ongoing to enhance and restore Uplands Park for birds as well as for native plants. Thank you to all dog walkers visiting Uplands Park for their co-operation and understanding. 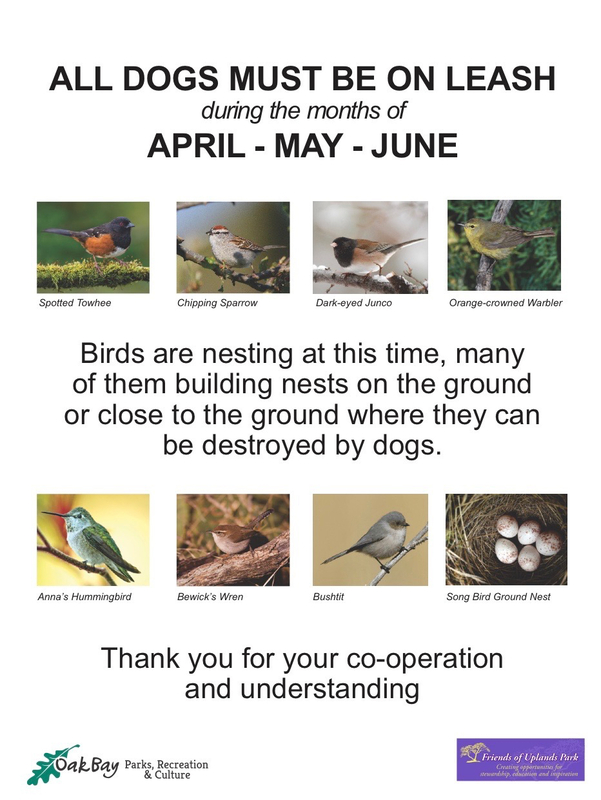 Posted on May 7, 2017 by Friends of Uplands ParkPosted in DogsTagged Birds.